Product code: ES8311 Categories: Antique, Antique Rings. 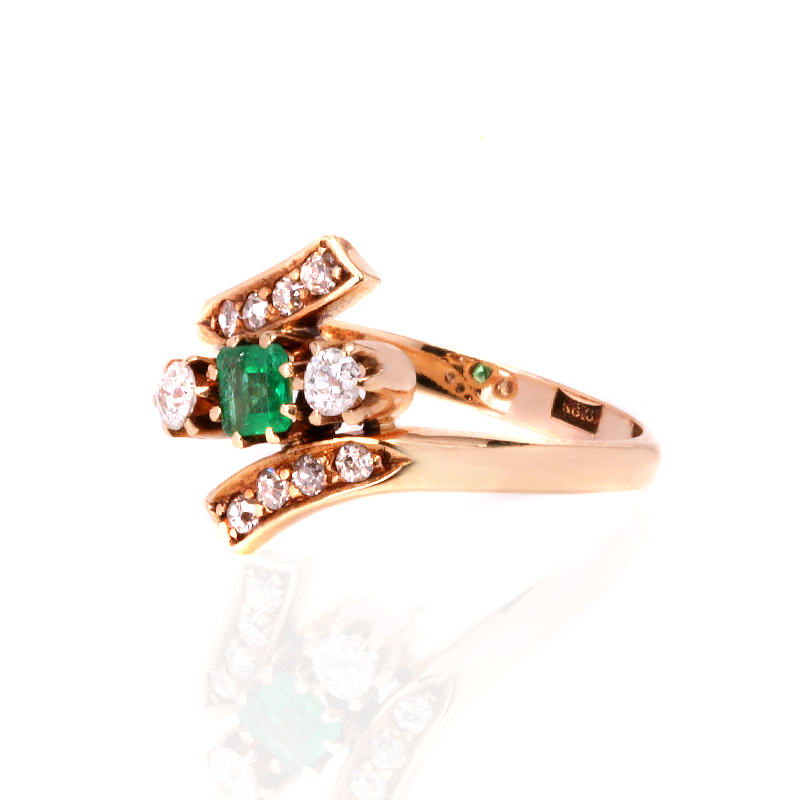 Hand made in 18 carat gold in the early 1900’s, this antique emerald and diamond ring in such a unique design has a look and style about it that will allow it to be worn with other antique rings, or modern contemporary rings and always fit right in. Set with a beautiful natural emerald that measures 0.24 carats, it has such a fine green and excellent transparency, and seems to hover magically in the centre of the ring. On each side is a European cut diamond to emphasise the look and design of the ring, as well as highlighting the emerald. These diamonds total 0.14 carats and then there are a further four European cut diamonds set on each band. In a wonderful twist to traditional rings, the bands on each side turn away from the centre making it such an amazing ring to admire on the finger. These additional diamonds total 0.12 carats and add the right amount of sparkle to an already very beautifully designed ring. Antique rings are so special and unique, and this one will certainly get the attention that it deserves. Tags: Antique emerald and diamond ring, Emerald and diamond ring. Set with a Colombian emerald and antique European cut diamonds.